As usual, I didn't pay for this book but it came to me through the grace and generosity of the author. Despite this kind consideration, I share my candid feelings on the book below.Our protagonist is a Civil War vet turned private detective and he navigates a world filled with deep intrigue and diverse characters. Potential readers are warned that the language in this book could be offensive to some as the book deals very honestly with matters of race and Eugenics in the post-war American South. Personally I find this unsanitized rendering of the time and place to be refreshing but the easily offended should make note before purchasing.To the positive side of the ledger, Musgrave delves honestly and in detail into the oft-forgotten episode of American history in which it was considered a good idea by many to sanitize the human race of anyone who wasn't white. Those who point with disgust at 1930s Germany are herein reminded that those Germans didn't invent anti-semitism and Eugenics. Musgrave displays to us through his work that hatred has much deeper roots. In addition to his larger history lesson, the author provides us with hoards of other amusing historical tidbits and isn't afraid to sprinkle them liberally throughout the narrative and even takes time to explain them in most cases.To the negative side, the aforementioned tidbits of history, while informative, can at times seem non sequiturs and can go on for several sentences interrupting the narrative flow. Language too is sometimes a problem as characters of various dialects repeat the same characteristic words or phrases over and over in an exaggerated verbal stereotype of a particular demographic. This can get a bit grating, me boy-o! Lastly, the dialog is at times melodramatic with characters proclaiming that they'll do "something" if it's "the last thing they'll ever do!" or phrase of similar hyperbole. One is reminded rather more of Adam West as Batman than a 19th century private investigator. Luckily these occurrences are fairly rare but when they do occur they do tend to stick out. Holy verbal protuberances, oh faithful readers!In summary, Sinai is an improvement over Musgrave's previous work. Like its predecessor, it is firmly rooted in real events and expounds upon them in a logical and believable manner. Musgrave's work is exceptionally well conceived but simply lacks a bit of editorial spit and polish. The occurrence of typographical problems in this book is also less than its predecessor and I have higher hopes still for the third volume in the series. Jim Musgrave - Jim Musgrave has appeared on "Authors on the Air" and has been invited back to discuss Steampunk fiction. He is the owner of English Majors Publishers and Editors, LLC in San Diego. 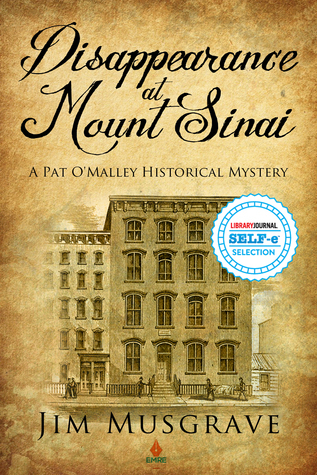 He is a widower and publishes the best-selling steampunk series Pat O'Malley in 1860s New York City. He also provides consulting and distribution services to indie authors to distribute their eBook titles to 1,000 online retailers and 65,000 libraries in over 100 countries. Marketing and metadata consulting as well as installation of the Embellisher Mobile Marketing and Sales platform.